Moto Adrenaline: Travels With STCPO - Bookmark it! Travels With STCPO - Bookmark it! Our friend Pete.. of the Pete and Kim clan that went to Colorado with us has started his own blog. Travels with STCPO. 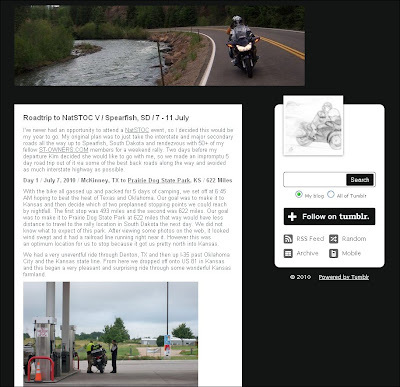 You can read about his recent trip to South Dakota and NatSTOC. Rumor has it his wife will be starting a blog as well, with her thoughts and stories of being part of the two up thing. We can't wait. What are you waiting for?? Go check it out!